Arshad Goods is a Midwest lyricist and St. Louis native that perfectly embodies the dichotomy of his generation. Arshad Goods' approach is humble yet hungry, which synthesizes to greatness in his bars and of course his flow. In each verse, Arshad proves that he's equipped to lyrically and intellectually compete with your favorite rappers. His personal style is grounded in his delivery that encompasses a variety of speeds. Fans of fast-spitting lyricism and those that prefer more harmonizing flows will find enough familiarity in what Arshad refers to as "BackTrap". His words cater to women in an innovative, yet direct manner. All the while, Arshad Goods reps hard for his side of town, University City, while still acknowledging the pitfalls his community has descended into. Arshad Goods has seen the American Dream, but has chosen to create and follow his own dreams. That is why the STL rapper holds no punches when it comes to speaking his truth-- raw and uncut. 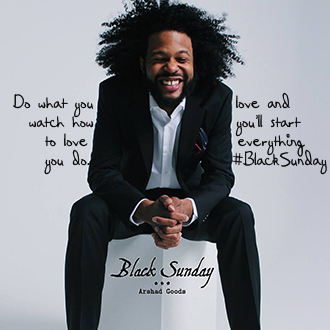 The first project from Arshad Goods is an EP entitled, "Black Sunday". His 30-minute listen fully speaks to life's balance of perception and reality. Arshad states, "Black Sunday is about duality and ownership." This is a story only he can tell. Welcome to BackTrap. Black Sunday EP is the perfect introduction for Arshad Goods through its concise length that leaves listeners needing more. What about this new rapper from the Midwest that's catching people's ears? Arshad Goods is the full package when it comes to Rap music. The EP's subject matter, delivery, and production are evidently attuned to the rapper's soul. There's no escaping that, and Arshad makes sure of it by cleverly approaching topics from different angles. His intelligence may not surpass other rapper's consciousness, but Arshad Goods is able to skillfully filter his thoughts into the microphone in a commercially viable package. He mentions that this project was about not compromising and honoring the highest potential of creative quality. His name for this style of creativity is "Back Trap". Black Sunday features local talent and the highlights track include: the title track, "Classic" and "Tell Her Lies".